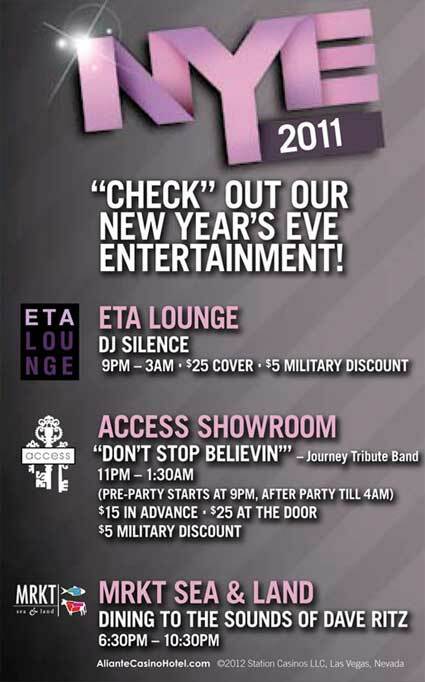 At ETA Lounge, DJ Silence spins the night away from 9 p.m. to 3 a.m., with Go-Go dancers shaking things up. Tickets are $25 at the door. Military members receive a $5 discount with valid military ID. Guests must be 21 years or older. Access Showroom features the classic Journey sounds with Don’t Stop Believin’. Doors open at 9 p.m. Don’t Stop Believin’ NYE Tickets are $15 plus tax and applicable fees in advance and $25 plus tax and applicable fees the day of the event. Military members receive a $5 discount with valid military ID. Guests must be 21 years or older. At MRKT Sea & Land, guitarist and pianist Dave Ritz performs Top 40 hits from 6:30 p.m. to 9:30 p.m.
At The Railhead, Yellow Brick Road performs with doors at 10 p.m. This Las Vegas-based classic rock tribute band takes on the entire classic rock/pop spectrum with an emphasis on details and inflections. Yellow Brick Road NYE Tickets are $24.95 plus tax and applicable fees in advance and $34.95 plus tax and applicable fees the day of the show. Tickets include a champagne toast at midnight. Guests must be 21 years or older. At KIXX Lounge, DJ Ania spins Top 40 and classic rock hits from 9 p.m. to 2 a.m. Guests must be 21 years or older. DJ Hyphy Crunk will spin into the New Year at Ovation, with doors opening at 9 p.m. Ovation Tickets are available for $75 plus applicable fees in advance and $100 plus applicable fees the day of the event. Tickets include an open bar from 9 p.m. to midnight. A VIP package, including entry for four people, reserved booth seating, open bar from 9 p.m. to midnight, two bottles of Skyy Vodka, party favors and breakfast at The Grand Café, is available for $600 plus applicable fees. A VVIP package is available for $1000 plus applicable fees and includes entry for four people, reserved booth seating, open bar from 9 p.m. to midnight, two bottles of Belvedere Vodka, a bottle of Dom Perignon, party favors and breakfast at The Grand Café. Guests must be 21 years or older. Guests can head to the Lobby Bar, as DJ Seany Mac spins into the 2012 with doors at 8 p.m. Lobby Bar tickets are $50 plus applicable fees in advance and $75 plus applicable fees day of performance. Tickets includes open bar from 9 p.m. to midnight. Guests must be 21 years or older. At Quinn’s Irish Pub, the Rustyn Vaughan Lee Band will perform from 6:30 p.m. to 9:30 p.m. Darby O’Gill & The Little People will continue the party from 10 p.m. to 2 a.m. Free entry with $30 all-you-can-drink special from 9 p.m. to midnight. Guests must be 21 years or older. Peter Love plays piano at Hank’s Fine Steaks & Martinis from 7 p.m. – 1 a.m. No cover and guests must be 21 years or older. At the Louie Anderson Theatre, a video DJ will play hits spanning from the ‘60s through the ‘80s. No cover and guests must be 21 years or older. At Jack’s, ‘Nuff Said performs from 9 p.m. to 3 a.m. No cover and guests must be 21 years or older. Club Tequila kicks New Year’s Eve off with La Nueva Live Mix featuring La Nueva’s Oscar “El Coyote” Ruiz along with DJ Lee and DJ Paco mixing the top Latin hits from inside Club Tequila from 8 p.m. to midnight. Cover is $20 before 11 p.m. and guests must be 21 years or older. The celebration continues at Club Tequila with Latin Night with Noche Nortena featuring El Moreno Carrillo Y Su Banda Tierra Sagrada, delivering the best in regional Mexican music from midnight to 5:30 a.m. Cover is $25 at the door and guests must be 21 years or older. The Feast Buffet kicks the celebrations off with John Earl & The Boogieman Band perform from 4 p.m. to 9 p.m. on New Year’s Eve day. Guests under 21 must be accompanied by an adult. At Cabo Lounge, John Earl & The Boogieman Band will perform from 10 p.m. to 2 a.m. Guests must be 21 years or older. Blue Agave features lounge music and Top 40 hits, as JARR performs from 8 p.m. to 1 a.m. Guests must be 21 years or older. At Rocks Lounge, guests can enjoy the alternative rock sounds of Franky Perez. Doors open at 10:30 p.m. and guests must be 21 years or older. DJ BKNY will ring in the New Year at Lucky Bar, beginning at 9:30 p.m. No cover and guests must be 21 years or older. At Onyx Bar, Toto Zara performs Latin dance and soul music from 8 p.m. to 12:30 a.m. No cover and guests must be 21 years or older. 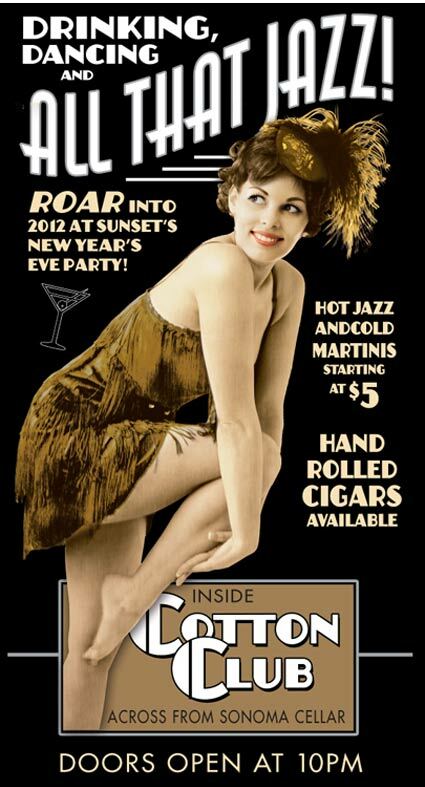 Ring in the New Year at Revolver with DJ Sinner. Doors open at 8 p.m. and tickets are available for $25 plus tax and applicable fees in advance and $40 plus tax and applicable fees day the event. Drink specials include 2-for-1 drinks from 8 p.m. to 10 p.m. For table and booth reservations, please call 702-495-3333. Guests must be 21 years or older. DJ Kram spins from 9 p.m. to 2 a.m. at 4949 Lounge. No cover and guests must be 21 years or older. At Club Madrid, Strung Out Sessions will celebrate New Year’s Eve with their acoustic hits. Doors open at 10 p.m. and tickets are $15 plus tax and applicable fees. Guests must be 21 years or older. At Gaudi Bar, Busker Kings, an acoustic power duo with a Foo Fighters meets Simon & Garfunkel sound, performs from 8:30 p.m. to 12:30 a.m. No cover and guests must be 21 years or older. Jerry Tiffe kicks off the celebrations early at South Padre, by bringing back the days of swing. Doors open at 1:30 p.m. on New Year’s Eve day. Cover is $10 at the door. True-2-Crue will continue the party at South Padre with their distinctive rock sounds. Doors open at 8 p.m. and True-2-Crue tickets are $15 plus tax and applicable fees. Entry includes a champagne toast at midnight. Guests must be 21 years or older. Over at A-Bar, Darrin Michaels sets the tone for a relaxing New Year’s Eve, with jazz from 7 p.m. to 11 p.m. No cover and guests must be 21 years or older. Guests can enjoy the sounds of Betsy Holm from 7 p.m. to 11 p.m. at Garage Bar. No cover and guests must be 21 years or older. Sideshow performs classics and the latest hits inside Martini Lounge, from 9 p.m. to 12:30 p.m. No cover and guests must be 21 years or older.